"Among magaling na lalaki ('efficacious men') there are simultaneously rivalry and mutual recognition of spheres of influence, territories, and enterprises. They follow each others' careers as carefully as do prize fighters and actors. They meet to arrange settlements of homicide, to fix politics, and to settle other matters of import 'out of court.' Other men, respectable citizens, seek out their company in order to be seen with men of reputation. The poor and weak come to them for assistance with their troubles. Ordinary men are fascinated by their ability to breach the moral order with impunity. Kardeng and Andron were even credited with possessing magical amulets, conferring in one case invulnerability and in the other invisibility, to account for their charmed lives." ​ [...] "Why ... are Filipino politicians so indiscreet? Why do they reveal -- and insist the interviewer write down -- matters that implicate them in grave crimes? The most economical explanation is that they wish to present themselves as magaling na lalaki ('real men'), who get their way in contests for dominance with other men. Dominance over women is not a test or demonstration of being a 'real man,' though women might become the prizes or appurtenances of one who has earned the reputation in encounters with other males. The real man exerts his will over other men in contests of power. That he uses illegal means forbidden to ordinary men, and gets away with it, confirms that the magaling na lalaki is not an ordinary man. He is above such limits. Thus, unlike a public figure in America or Australia who would publicly and vehemently deny that he asked a judge a favor, Grasing de Guzman, known as the Godfather, described to me how by a combination of force, terror, and bribery of his opponents' lawyers, of witnesses, judges, police, and prosecutors, he routinely obtained favorable decisions for himself or for the hacienda he managed for Dona Narcisa." 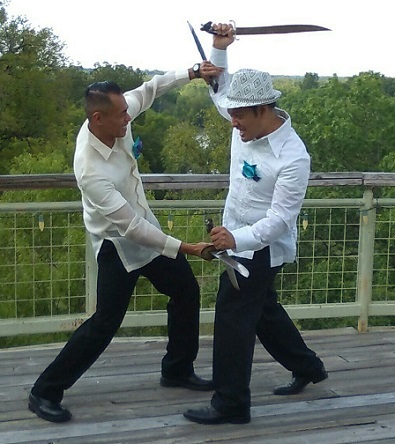 "The men's costumes are known as barong tagalog and consist of long cotton trousers and white, long-sleeved shirts worn outside the trousers." 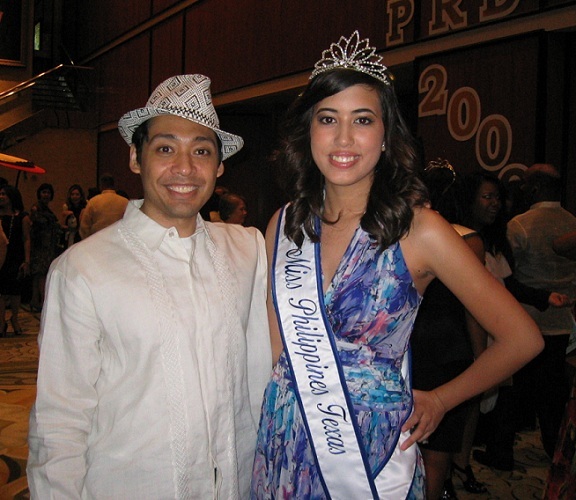 "The national attire for Filipino men is the Barong Tagalog shirt. It is made of pina, a soft, delicate cloth made from the leaves of the pineapple plant, or from other similar materials. The shirt is beautifully embroidered and worn outside the trousers. From the President on down, this style of dress is followed, though the rest of the costume is Western." "It was not until the post-World War II era that the barong tagalog truly came into its own, thanks in no small part to the movie industry that sought to contribute to the development of values fitting the newly independent nation. The barong tagalog was chosen as the visual representation of humility and integrity. 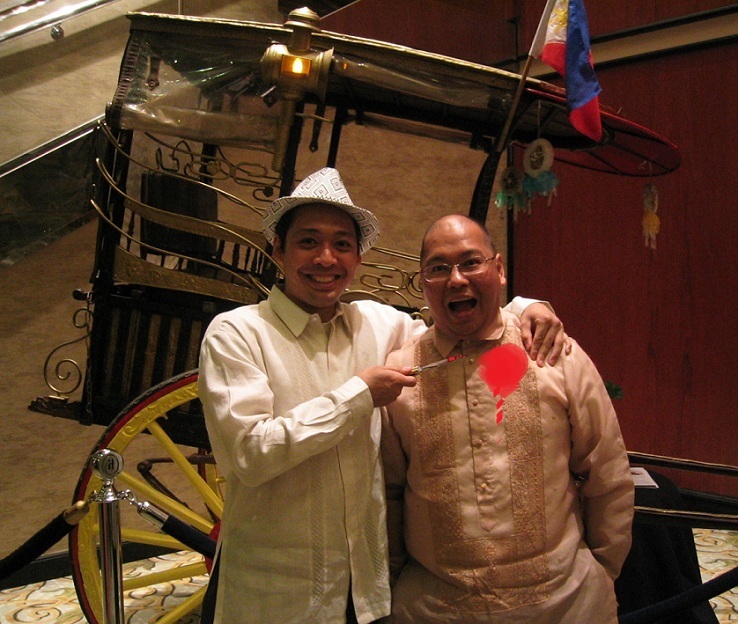 The hero always appeared in a barong, while the city-slicker villains were impeccably dressed in Western cloths [sic]. The popular 1950s movie star Leopoldo Salcedo, pioneered a Valentino-style of barong tagalog, and soon the shirt became fashionable again. The reputation and status of the shirt was affirmed as all Philippine presidents wore the shirt on state occasions and as designers for Pierre Cardin and Christian Dior used the barong and redesigned it for high culture fashions." "The balisong or 'butterfly knife' is arguably the most controversial, well-known, and infamous indigenous weapon of the Philippines. First constructed in 1905 in Batangas, Philippines by Perfecto de Leon, the balisong gained mass exposure after World War II when the Batangueno bladesmiths earned a living providing custom crafted knives to American servicemen stationed in the Philippines at Clark Air Force Base and Subic Naval Base." 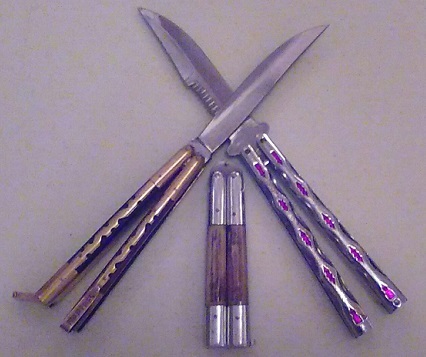 "One of the more popular instruments associated with ... Filipino martial arts is the 'spiritually and physically blessed' balisong. The balisong, or butterfly knife, originated in the Batangas region of the Philippines, and so it is sometimes called Batangas. It is also referred to as the Vientenueve, or 'twenty-nine,' because, as legend has it, a great master in the blade arts could dispose of twenty-nine enemies with his butterfly knife. ​ "The literal translation of the word 'balisong' is 'breaking horn' or 'breaking song.' The term 'break' comes from the way the knife 'breaks' open to expose the concealed blade. The word 'song' usually refers to the rhythmic clicking sound the knife makes when it is artfully manipulated." "My late uncle, a retired colonel in the Philippine Army, never tired of relating to me the tradition in Batangas during his youth. 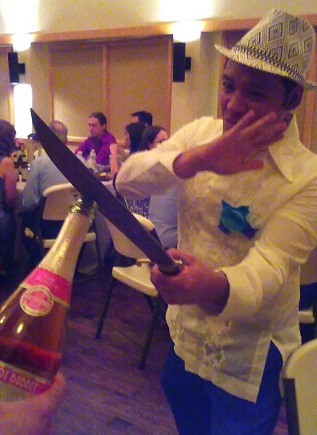 Everybody packed a balisong as part of the traditional barong Tagalog outfit during formal public functions. Oftentimes, tempers would be lost and knife fights would be resorted to. He often cautioned me to observe the unwritten law of the knife fighter: If he draws his knife but with the blade unexposed, the fight can still be averted. If he exposes the blade, a fight is inevitable. But the one carrying the all-purpose razor-type blade, when pitted against someone with the fighting blade, has the option of closing his drawn knife and graciously bowing out (accepting his opponents's superiority), which the other party must acknowledge. It is almost always the person wielding the razor-type blade who must yield to the fighting blade wielder if a fight is to be avoided, hence preventing any fatalities. ​ "Having grown up in Batangas with my cousins, this was considered 'normal behavior.' Gentlemen acted as gentlemen, even in a knife fight." "There are many legends of how this knife came about. Filipinos recall a warrior trained in the native martial arts who defeated 29 enemies with a fast folding knife. They also call this same knife the 'Veintinueve or 29 meaning the knife when fully open was 29 inches long and used to hunt wild game. It is believed that this was the earliest form of the Balisong knife. 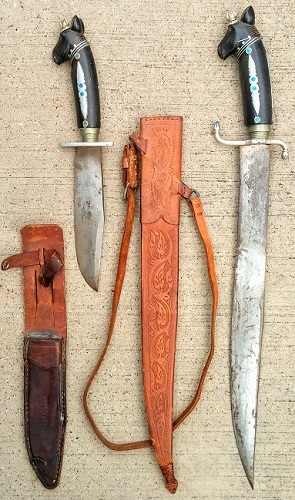 ​ "In 1872, a design similar to the native Philippine knife was patented in the United States. It has not been proven, but it is rumored that someone may have brought this design to the Philippines with the hope of mass-producing them, by using cheap native labor than back in the States. Then exported back to the U.S., this was thought to be more feasible since the cutlery business was so highly competitive with Europe (especially from Germany and England), and also help America's growing steel industry."